Home / Security news / Vpn and security / WhatsApp / Beware! 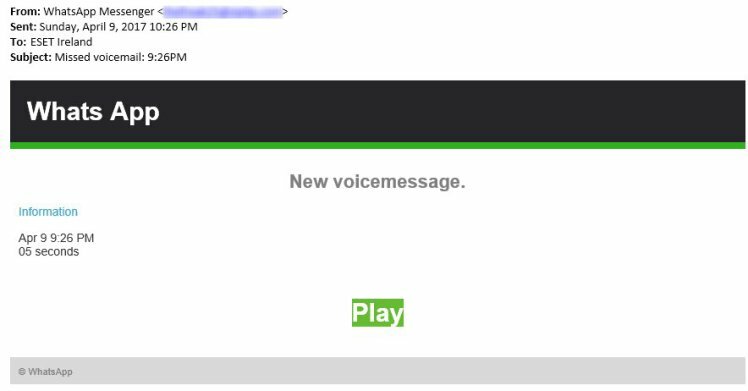 This WhatsApp voice message is a Trojan Virus! Beware! This WhatsApp voice message is a Trojan Virus! A new WhatsApp scam is on the prowl, tricking WhatsApp users to click on an email that claims to come from WhatsApp, ESET security says. The scam mail which pretends to come from WhatsApp, drops at the target mailbox with the subject "Missed voicemail" and the content of the mail says "New voicemessage" and has a clickable link called "Play". The mail owner triggers the download of a Trojan named "JS/Kryptik.BBC" the moment the "Play" link is clicked upon. Security recommendations dropped by ESET includes telling users not to click on any link in an unverified email claiming to come from WhatsApp. It is better to log in to your WhatsApp account the standard way and check for messages there. Trojan infection can expose the computer to ransomware which might end up locking your documents and files and demand ludicrous amount for your system to be unlocked.